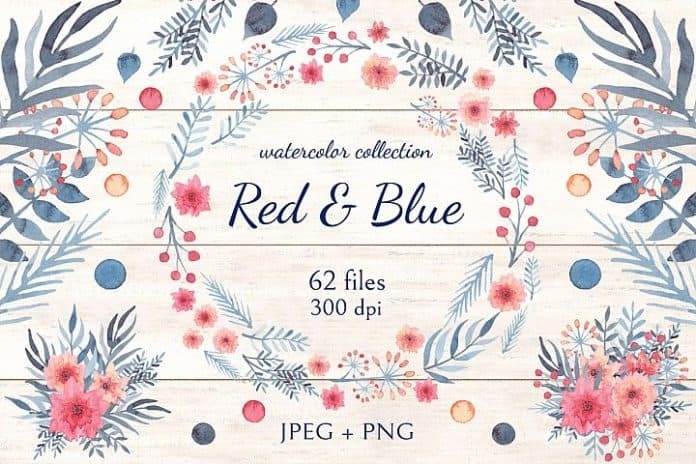 This collection contains high-res watercolor flowers, leaves, berries, wreaths, seamless patterns, card templates, borders and bouquets and into different colors Red and Blue. The Illustrations are created by Salted Galaxy. Let’s take a look at some of the designs. This floral collection in pastel blue and red colors is ideal for use on wedding invitations, cards, logos, packaging design and more. All JPEG on white background, all PNG on transparent background, RGB.